This year’s catastrophic impact of hurricanes Harvey, Irma, and Maria, has left many communities with the daunting task of having to rebuild. The Federal government offers help to homeowners directly affected by this season’s hurricanes. Drawing on lessons learned about coastal building damage after past hurricanes, FEMA produced Home Builder’s Guide to Coastal Construction, a 180 page manual including a series of 37 fact sheets to provide technical guidance and recommendations concerning the construction and renovation of coastal residential buildings. The Guide is a proven success to assist anyone living in an area subject to flood and wind forces; especially along America’s coastal low lands, and vulnerable locales including, Florida, and America’s Caribbean territories of Puerto Rico, and the U.S. Virgin Islands. Whether you’re a builder, contractor, realtor, homeowner, business owner, or working in the construction, real estate, or economic development arena, you’ll find this comprehensive manual and fact sheets present incredibly valuable and immediately useful information aimed at improving the performance of buildings subject to the fury of flood and wind forces found in coastal environments. Harvey, Irma, and more to come! Be prepared for a busy hurricane season. Agencies of the Federal government are stepping up to do everything possible to help communities in “harm’s way,” with this year’s hurricanes of historic proportion causing devastating impact in Texas, Florida, and other coastal states. You can become better prepared to face potential new storms through preparedness you can take in advance of any future natural disaster such as hurricanes, with help from the government. At https://bookstore.gpo.gov there’s a variety of publications available providing expert advice on getting ready prior and better prepared after a storm of serious magnitude hits your community. Guidance for contractors, roofers, property restorers, local and state public officials, volunteers, and individuals to better understand how to rebuild and move to a better tomorrow. Here are a few to consider; or go on https://bookstore.gpo.gov. Disaster Preparedness Manual: Natural Disasters, Man-Made Disasters, Patient Fact Sheets. This manual, comprised of three major sections, summarizes actions that Veterans and their families can take to effectively cope with a disaster. This illustrated reference emphasizes actions designed to prevent or reduce impact of natural or human-caused hazards. Information is also presented to assist those with access and functional needs, including children, people with disabilities, and older adults, as well as pets. Thunderstorms, Tornadoes, Lightning, Nature’s Most Violent Storms: A Preparedness Guide, Including Tornado Safety Information for Schools an illustrated guide showcases some facts about weather-related events, and suggests life-saving actions you can take if you find yourself in an unexpected situation resulting from a weather-related event. Psychosocial Issues for Children and Adolescents in Disasters provides information and guidance for individuals concerned with the mental health needs of children who experience major disasters. This background, training, and experience will vary and may include physical and mental health professionals, professional and paraprofessional social service personnel, school and daycare personnel, clergy, volunteers, and parents. Do yourself, and America, a favor. Be prepared. Be educated. Be ahead of the next natural disaster where you live. Save lives, including your own. It’s been an exceedingly hot here for the past month or so. When we had our record-breaking snowfall in February, everyone was longing for the warmth of summer. Now it’s here with a vengeance, and a brisk breeze would be most welcome. Sometimes the best way to fight the heat is to experience cold weather vicariously, which is easy to do in a real Government classic: American Weather Stories. 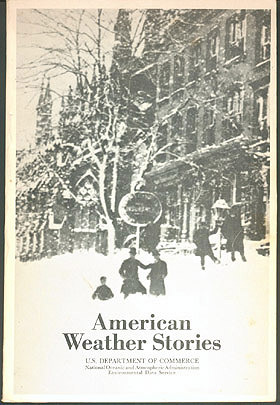 Originally appearing mainly in various National Oceanic and Atmospheric Administration (NOAA to the cognoscenti) publications, the essays in this 1976 publication covers all kinds of weather, but I was drawn to “The Year Without a Summer.” The year 1816 witnessed extraordinarily frigid temperatures throughout the Northern Hemisphere. In the American Northeast, there were two snowstorms in June and frost in June, July, and August. Farmers suffered severe crop losses in each of those months. It may have been no coincidence that the first general migration from new England to the Middle West occurred the following year. Meteorologists generally agree that fine particles in the upper atmosphere generated from an unusual number of worldwide volcanic eruptions caused this bizarre weather phenomenon. Although long out of print, a commercial publisher has issued a reprint. I had no luck finding the text online, but you can find the original at a library. Addendum: Thanks to Emily Carr at the Library of Congress, I can now share this online text with you. I believe this blog is evidence that Government books can provide both information and entertainment to readers, despite their stereotyped image as massive tomes packed with charts and statistics that only someone wearing a green eyeshade could love. Sometimes, though, charts also have their charms. Consider one of Library Journal’s 2009 Notable Government Documents: Tropical Cyclones of the North Atlantic Ocean, 1851-2006. Known to hurricane aficionados as “The Track Book”, this latest edition of a long-running series is mainly made up of year-by-year charts of the tracks of all North Atlantic tropic storms and hurricanes – 1,370, to be exact. 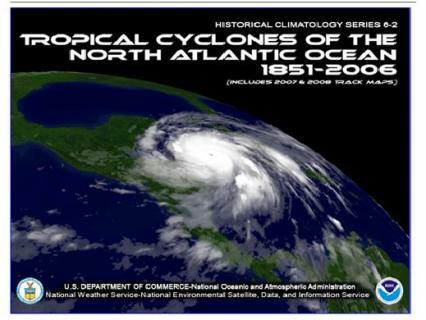 Thanks to some diligent research by the staff of the Hurricane Research Division of NOAA’s Atlantic Oceanographic and Meteorological Laboratory, this edition includes charts from 1851 to 1870 and revised charts from 1871-1910. I’m intrigued by the kind of research that had to be done to come up with tracks for the 19th century storms – no satellite photographs then. Apparently ship records are a major source. Well, OK, but so what? For one thing, of those 1,370 storms, 521, or 38 percent, have crossed or passed immediately adjacent to the U.S. coastline from Texas to Maine. Having recently blogged about the National Guard in the aftermath of Hurricane Katrina, the colorful spaghetti-like strands that mark the tracks of 2005’s storms make these charts a lot more meaningful. It’s also interesting to see the variations from year to year – 2005 is a real tangle, while for a handful of years the charts are almost blank. Tropical Cyclones of the North Atlantic Ocean, 1851-2006 isn’t exactly “a good read” but it does have a fascination all its own. For hurricane watchers, for example, it’s a vital reference source. You can look at it here. To find a library that has it, go here. To read more about the lessons Hurricane Katrina taught all of us, go here. Happy hurricane hunting!